December 2011 – Concurrent Technologies introduces their latest high performance 6U CompactPCI® processor board. The PP 83x/x9x supports the Intel Core i7-2715QE processor, Intel Core i7-2655LE processor or Intel Core i7-2610UE processor and the enhanced features of the Intel Series 6 Express chipset, along with up to 8 Gbytes of DDR3-1333 ECC SDRAM. Users of the PP 83x/x9x can expect a significant increase in processing and graphical performance over previous Intel® Core™ processor based 6U CompactPCI products. In addition, the PP 83x/x9x has been designed to accommodate the next generation Intel® Core™ processor-based platform thereby providing customers with a convenient upgrade path, extending product life and protecting previous software investments. Supporting up to two 100MHz PCI-X PMC or XMC x4/x8 PCI Express® sites, the PP 83x/x9x maintains compatibility with the previous generation product (PP 432/052) and offers an array of rear I/O functions – 1x RS232, 2x Gigabit Ethernet, 2x USB 2.0 and 2x SATA interfaces. The front panel supports the following interfaces on industry standard connectors – up to 3x USB 2.0 interfaces, 2x Gigabit Ethernet, optional DVI-I graphics and optional RS232 interface. For application and data storage there is an onboard site for a CompactFlash® module and an onboard option for a SATA300 2.5-inch disk drive. The board can operate as a system controller board, a peripheral board or as a satellite board (blade). 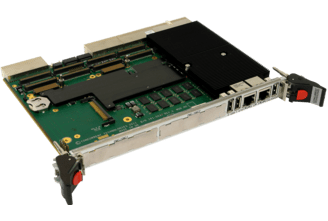 Support is also provided for PICMG® 2.16 (Ethernet fabric), PICMG 2.9 (IPMI) and PICMG 2.1 (hot swap); the CompactPCI backplane interface operates at 33/66MHz PCI signalling speeds. Operating systems currently supported are Windows® 7, Windows® XP, Windows® Embedded Standard 7, Linux® and VxWorks®. Additionally, to address today’s demanding applications within markets such as defense, security, and communications, the PP 83x/x9x SBC is designed to scale from commercial temperature grade 0°C to +55°C (N-Series) through to extended temperature grade -40°C to +85°C (K-Series) for harsher environments.